Prepare for pregnancy and increase fertility with red raspberry leaf tea. This herbal supplement is truly an all-around remedy for your reproductive system. Red raspberry leaf (RRL) is a natural remedy that is loaded with vitamins, minerals and antioxidants essential for fertility and pregnancy. These include vitamin C, E, A, B complex, calcium, iron, phosphorus, potassium, manganese, and magnesium, just to name a few. So you can see from this how beneficial this herb can be for your whole body, let alone for your uterus and other reproductive organs. The herb is made from the dried leaves of the raspberry bush and can be made into teas/infusions, tinctures, or taken in capsule form. 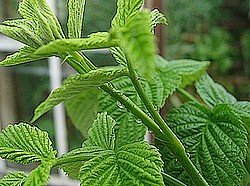 Red raspberry leaf for fertility works best as an infusion (tea). This herbal remedy is well known and widely used for centuries for its ability to tone and strengthen the uterus. The alkaloid fragrine from the raspberry leaf targets the uterus and other pelvic muscles. It works to relax and strengthen these muscles to ready your body for an easier labor and delivery. What's great about red raspberry leaf is that it works with your body to do what it needs when it needs it. It doesn't do anything that your body is not ready to do on it's own. It only helps your body to do more efficiently what it is going to do anyway. correct luteal phase defect to allow enough time for implantation to take place. This relaxation affect explains why red raspberry leaf tea is useful for relieving menstrual period cramps and PMS. This is another great use for it even if you are not trying to conceive. During the 3rd trimester of your pregnancy, this herbal supplement continues to strengthen, relax and tone your pelvic region. You should know that raspberry leaf tea does not cause contractions or start labor. It doesn't do anything that your body is not ready to do. When your body is ready, it helps contractions to be more focused so that delivery time is shortened and thereby less painful and less stressful for you and your baby. This is one of the fertility herbs that is safe to use throughout your pregnancy. It is a misconception that this herb should not be taken in the first trimester. It is this mis-belief that it brings on contractions that some medical practitioners will tell you not to use it until the last month or so 'just to be safe'. It is my belief (and that of many herbalists and natruropathic practitioners) that red raspberry leaf tea is safe even in the 1st trimester because of my research of studies on the effects of the herb and my personal experience with red raspberry leaf. Take an ounce of the dried leaves put into a glass jar, pour a quart of boiling hot water over it, put the lid on and let sit (steep) overnight (at least 4 hours), strain and refrigerate. Then drink (hot or cold) throughout the day at least 3 cups per day throughout your entire ovulation cycle. Once pregnant, continue to drink a cup a day during the first trimester, then 2 cups a day during the second trimester and 3 cups a day during the third trimester. As RRL also tones the uterus and readies your body for labor and delivery. Peppermint is a common ingredient in fertility teas to aid in the absorption of nutrients, has a calming, soothing affect, and may have sexual stimulant properties. Be sure to include peppermint if you are infusing with red raspberry leaf. You can buy red raspberry leaf for infusion at your local health store. Or click the image below for organic RRL tea. Quick fix: Raspberry leaf tea can be prepared by steeping 1 teaspoon (or one tea bag) of dried herb in 8 ounces of boiling water for 5 – 10 minutes. (just remember steeping longer brings out more of the nutrients). It is excellent when taken alongside red clover and/or nettle. Ferility herbs taken together can actually help boost each other's effectiveness. You may wish to buy preblended fertility teas. These tea blends are premeasured to contain the right amounts and contain the appropriate blends of herbs to increase fertility. The one I like best is Conceptions Tea from the Natural Fertility Shop. Others I like are Pre-Conception Tea from The Fertility Shop and Fertilitea from FairHaven Health. Also a tea ball may come in handy if you buy loose-leaf teas. But, every 'body' is different, and you should therefor seek the advise of your health care provider and heed his/her advice as to your particular case and unique circumstances. For instance, red raspberry leaf tea can reduce blood sugar. This is another way it boosts fertility for some women. But for some diabetics, this can be dangerous. So please follow the advice of your practitioner. You may also wish to seek out an herbalist or mid-wife that is knowledgeable of the uses and disadvantages of fertility herbs.